The Journal of Judicial Administration (ISSN: 1036-7918) is a leading forum for the discussion of contemporary issues impacting on judicial administration. • education programs to enhance the work performance of justice system personnel. The Journal of Judicial Administration is published in association with the Australasian Institute of Judicial Administration (AIJA). The articles featured in the Journal are written by leading judges, academics, practitioners and other legal specialists and experts. Professor Greg J Reinhardt is the Executive Director of the Australasian Institute of Judicial Administration. He is also a member of the Melbourne Law School at the University of Melbourne. PUBLISHED IN ASSOCIATION WITH THE AUSTRALASIAN INSTITUTE OF JUDICIAL ADMINISTRATION. The latest Part of the Journal of Judicial Administration includes the following articles: “The Transformation of Court Governance in Victoria: Part I – Key Concepts and Models” – Tim Bunjevac; “A Death By a Thousand Cuts: The Future of Advocates’ Immunity in Australia” – Corey Byrne; and “Literature Review: Cultural Considerations in Alternative Dispute Resolution” – Antonella Rodriguez. The latest Part of the Journal of Judicial Administration includes the following articles: “Thirty Years Is Long Enough: It Is Time to Create a Process That Ensures Covert Recordings Used as Evidence in Court Are Interpreted Reliably” – Helen Fraser; “On Public Opinion Discourse: Justice Applications’ – Pamela D Schulz OAM and Andrew J Cannon AM; and “Right Here Waiting For You: The New Social Media Chapter in the Australian Guide to Judicial Conduct” – Marilyn Bromberg. The latest Part of the Journal of Judicial Administration includes the following articles: “Contempt and the Australian Constitution – Part Ii” – Anthony Gray; and “A Restorative City for New South Wales – Could Newcastle be a Model?” – John Anderson and Nicola Ross. 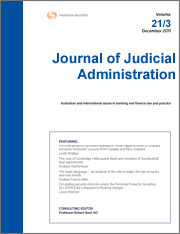 The latest Part of the Journal of Judicial Administration includes the following articles: “Contempt and the Australian Constitution – Part I” – Anthony Gray; “Pleading Guilty: Issues and Practices – A Socio-Legal Research Case Study” – Kathy Mack, Sharyn Roach Anleu, Jordan Tutton; and “Sustainable Justice: A Guiding Principle for Courts” – Dr Andrew J Cannon AM. The latest Part of the Journal of Judicial Administration is a Special Issue, featuring a number of papers presented at Second International Conference on Non-Adversarial Justice (NAJ2017) hosted by the Australasian Institute of Judicial Administration. It includes the following articles: “Non-Adversarial Justice: An Evolving Paradigm” – Warren Brookbanks; “Constructions of Impartiality in Mediation” – Susan Douglas; “Therapeutic Jurisprudence and Due Process – Consistent in Principle and in Practice” – Nigel Stobbs; “Effective Participation of Vulnerable Accused Persons: Case Management, Court Adaptation and Rethinking Criminal Responsibility” – Felicity Gerry and Penny Cooper; and “Non-Adversarial Approaches to Domestic Violence: Putting Therapeutic Jurisprudence Theory into Practice” – Rachael Field and The Hon Eugene M Hyman. The latest Part of the Journal of Judicial Administration publishes the following articles: “Individualised Justice through Indigenous Community Reports in Sentencing” – Thalia Anthony; “Haters Gonna Hate: When the Public Uses Social Media to Comment Critically or Maliciously about Judicial Officers” – Marilyn Bromberg and Andrew Ekert; “Trial by Judge without Jury – Some Contemporary Reflections” – Russ Scott; and “Ethical Duties Owed by Lawyer Mediators: Suggestions for Improving the NMAS Practice Standards” – Bobette Wolski. The latest Part of the Journal of Judicial Administration includes the following articles: “The Inclusion of Ex-prisoners on Juries” – Anthony Gray; “Opportunities and Challenges for Open Justice in Light of the Changing Nature of Judicial Proceedings” – Sharon Rodrick; and “Intermediate and Final Courts of Appeal: Chalk and Cheese?” – Justice Susan Glazebrook. The latest Part of the Journal of Judicial Administration includes the following articles: “Judges and community engagement: An institutional obligation” – Sam Bookman; “Questioning the evidence: A case for best-practice models of interviewing in the Refugee Review Tribunal” – Jessica Findling and Georgina Heydon; “Is the representative nature of juries justiciable?” – Anthony Gray; and “Four recent decisions on sentencing Aboriginal people” – Christopher J Charles.